As the mercury soars alongside the electricity bills paying for that air-con, it is safe to say the hot season in Koh Chang, indeed Thailand, is in full swing. The season runs from March through to the onset of the rainy season, middle to late May and during these months, the temperature reaches the high 90°’s, remaining there or thereabouts day in and day out, dropping only marginally into the mid 20°’s at night. Koh Chang has the added bonus of intense humidity created by all that wonderful rain forest in its interior, so it can seem even more sweltering. There are the odd thunderstorms which momentarily clear the air and cool things down, but on the whole, the heat is unrelenting, with even the sea taking on all the refreshing properties of a warm bath. At this time of year, water shortages on Koh Chang are a part of life. Contrary to what you might expect. there are no underwater pipes running from the mainland ensuring a constant supply but instead, all of the freshwater comes from the mountains. If you look closely around any building, you’ll notice scores of blue pipes leading every which way and more often than not, these are fed from a solitary pipe, blue again, that snakes its way though the undergrowth from some sort of natural rock pool high up on the hillside. 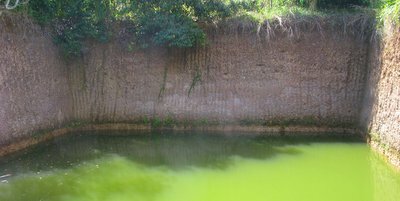 These pools have an owner, a stake put down on them many years back and that owner may well have hauled concrete up though the forest to reinforce and expand them, knowing how precious every last drop will be come the hot season, when their natural ability to refill overnight from forest run-off is sorely tested. Some other lucky locals have their own wells or reservoirs on their land and they make huge daily sums by delivering and selling water from 2000 litre tanks on the back of pick-up trucks to desperate bone-dry businesses and homes. The big resorts have dug deep and expensive wells but these too get dangerously low, as the number of showers taken by their guests rises in line with the temperature, exacerbating the problem. All in all, water is in short supply until the rains break and everything gets a chance to replenish. The number of foreign tourists to the island drops away considerably at this time of year, but most places are open as normal, with activities such as snorkeling and diving, even jungle trekking all available. It’s just very hot and truth be told, a little uncomfortable, with only mad dogs, Englishmen/Russians and the very committed (should be committed) braving it on the beach to sunbathe. With it being Thai school holidays and those water shortages, you do find some businesses close up, taking the opportunity to visit family up country and such like, but if you do visit Koh Chang now, all you’ll probably notice is how relatively quiet it seems. Thai said, let’s also not forget that the Thai holiday period is still very much ongoing, April having seen the Songkran Festival and May now featuring other public holidays such as Labour Day, Coronation Day and the Buddhist Visakha Bucha. The island can fill up very fast at weekends as the locals escape the stifling city heat for a day and a night before sitting in very slow, very long, unbearably hot queues at the ferries to the mainland, oh yes, Bank Holidays are the same the world over. If you can forget the heat for a moment, one great thing about this time of year is the Thai fruit. 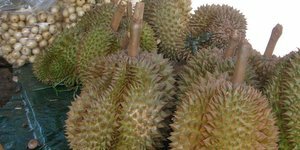 Week by week, different varieties come into season, moving from jackfruit and rose apple through durian and star fruit to rambutan, longan and mangosteen. Salak Phet and its vast orchards quietly ripen away under the hot hot sun and each day new produce, fresh from the trees, appears on makeshift tables by the roadside, tempting those weekending Thais with bargain prices as they return home, though truth be told, it probably doesn’t make it beyond the boats. Incidentally, today is also a public holiday, Royal Ploughing Day, which marks the traditional start of the rice growing season here in Thailand. A unique ceremony, beamed live to the masses on national TV, it is held in Bangkok in the area known as Sanam Luang at the front of the Grand Palace. Overseen by a member of the Royal Family, the grandly named Lord of the Festival draws straws or actually pieces of cloth to glean the amount of forthcoming rain, before two oxen plough furrows in a unique configuration and rice seeds are scattered. That done, the beasts are offered refreshments and depending on which they pick from choices including hay, water, even rice-whiskey, more predictions can be made on the year’s prosperity. Finally, the public are allowed to collect the highly esteemed rice seeds, which are thought to ensure a great crop if mixed with their own seeds when they plant their own crop for the year back home.